The collision of two galaxies can have spectacular results. In this image, the two galaxies, NGC 4038 and NGC 4039 are actually merging to eventually become a single galaxy. Their merger began a few hundred million years ago, and will probably continue for another billion years or so. This gravitational interaction spurred a tremendous amount of star formation in the merging core. Where the two galaxies are colliding, astronomers observe many young star clusters. Additionally, each of the galaxies has sprung a "tidal tail" comprised of stars and gas that were ripped away from the main galaxies. 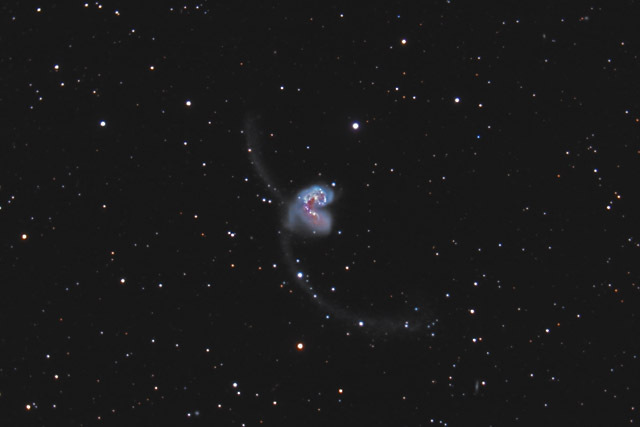 Commonly called the "Antennae galaxies", NGC 4038/4039 are also known as the Ringtail Galaxy. In this image, North is up. This image is cropped to 63% of the original full frame. Software Used Images Plus 4.5 for camera control, calibration, stacking, digital development, Lucy-Richardson deconvolution, multiresolution sharpening, smoothing and noise reduction. Photoshop CS5 used for levels and curves, color balance, high pass filter, star shrinking, saturation adjustments, screen mask invert, and noise reduction. Gradient Xterminator for gradient removal. Carboni Tools for additional saturation adjustments, noise reduction, and smoothing. HLVG for additional color correction. Notes This is the first image I have completed using my new ONAG on-axis guider. The ONAG guider allows me to use my guide camera while it is looking through the main imaging telescope instead of using an attached guidescope. This type of guiding yields more accurate guiding and, accordingly, better image details. Sure enough, I was able to capture very fine detail with this image. However, I'm not too pleased with my processing on the image and I plan to reprocess it at a later date. Nonetheless, the Antennae galaxies are so unusual, the image overall looks pretty good.